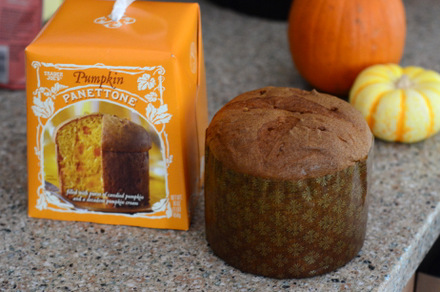 In the fall, pumpkin spice is everywhere. It is in the coffee drinks at your favorite coffee shop, in your pies, your cakes and your ice creams. Pumpkin pie spice is a blend of the spices typically used to season a pumpkin pie. It includes cinnamon, ginger, nutmeg and cloves, through it can also include ingredients such as cardamom, allspice, orange and anise. This spice combination is so often used with pumpkin that you don’t even need pumpkin present in your recipe to evoke the spirit of the fall baking season. When I want a pumpkin spice dessert, I usually start in my spice cabinet. This year, however, I decided to do things a little bit differently and I made a batch ofÂ pumpkin pie spiced vanilla extract, or Pumpkin Spice Extract. 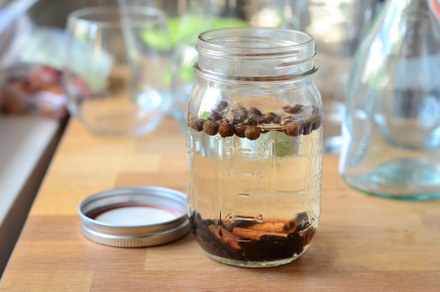 This homemade extract is made with vanilla beans, cinnamon sticks, allspice berries and cloves. The spices are covered with a neutral spirit (I used vodka) and allowed to infuse for 1-2 weeks. 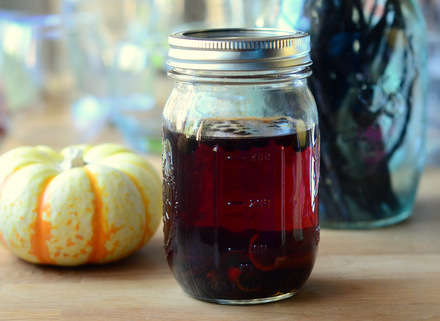 The result is a flavorful extract that can be used just like regular vanilla extract, only it delivers a concentrated dose of pumpkin spice in every drop. Making the extract is very simple. Add your whole spices and vanilla beans to a jar, fill with vodka and wait. I give the jars a shake every couple of days to make sure they are on the right track. 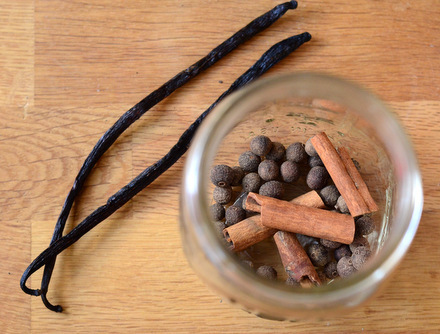 While the allspice berries and cloves can be added whole, I recommend breaking up your cinnamon sticks a little bit and chopping up your vanilla beans into small segments. Breaking down these two ingredients will help pull their flavor out much more quickly. While a week might seem like a long time to wait, it will fly by and you’ll be ready to use the extract in no time at all. The extract might not smell strongly of pumpkin spice when you open the jar, but you will taste all of those wonderful spices as soon as you use it. You can strain out the spices once the extract has infused or, if you don’t mind your extract becoming a bit more potent, you can leave them in the jar until you’ve used everything up. The extract will not go bad and it will last as long as it takes you to use up the batch. The extract can be used as a direct replacement for vanilla extract in recipes where you want to add a little spice. It can also be added to a recipe that already uses fall spices (such as a homemade pumpkin pie filling) as a way to amp up that flavor. You should be able to add a teaspoon of it to just about any recipe you have in your collection, from cookies to cakes, without having any impact on the consistency of the finished baked good or the baking time required to make the dish. Split vanilla beans lengthwise and chop into 1-inch pieces. Break cinnamon sticks into several pieces. Combine all ingredients in a clean glass jar, such as a mason jar. Seal tightly and let stand for 1-2 weeks, shaking the container every 2-3 days. *Cinnamon sticks, allspice berries and whole cloves can be found in the spice aisle at many supermarkets. 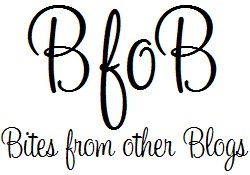 They’re also readily available at many asian and mexican grocery stores, as well as online. As always, Nicole, you’re a genius!